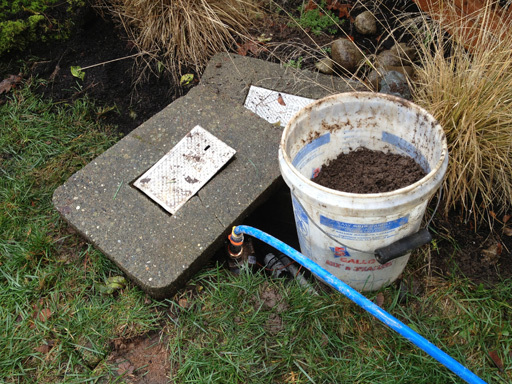 This is the third post in a series about our front-yard water line emergency that occupied much of the Thanksgiving holiday week. Our temporary water line is here today! This line lets us completely bypass the broken line and gives us clean running water indoors. 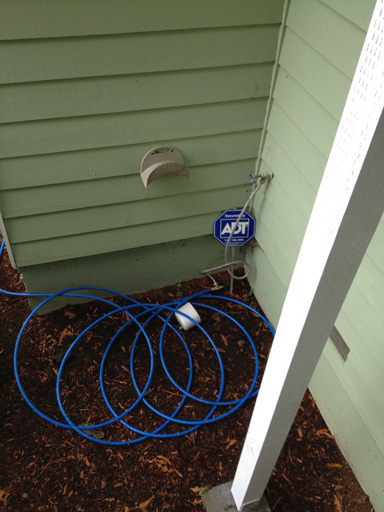 It’s basically a blue hose running from our water meter (near the curb) into our hose spigot (at the front of the house). I didn’t know you could get water into your house this way, but apparently this is a reliable technique that can even be used to get water from a neighbor’s house. Our new, permanent water line goes in after the Thanksgiving holiday.